Dr. Jeffery Hoadley earned his bachelor's degree in Mathematics from Vanderbilt University in Nashville, Tennessee, in 1984. He went on to obtain his Masters in Physiology from Georgetown University in 1985, and graduated as a Doctor of Medicine from the Emory University School of Medicine in Atlanta in 1989. Dr. Hoadley served his residency in general surgery at the Emory University Affiliated Hospital, and was awarded a fellowship in hepatobiliary surgery with the Cleveland Clinic Foundation. 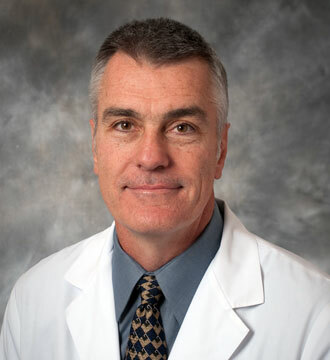 Since 1995, Dr. Hoadley has served as a staff member at Saint Joseph's Hospital and at the Northside Hospital in Atlanta, where he also serves on the surgical case review committee, the nutrition support committee, and the critical care committee, respectively. He has given a number of research presentations, the most recent being a retrospective study of hepatic resections performed at the Cleveland Clinic from 1984 to 1994. Dr. Hoadley has served on the Special Olympic Honorary Board, the Mercy Mobile Indigent Care Fundraiser Golf Committee, and as the Leukemia and Lymphoma Co-Director of the 2001 5k run honoring Dr. L. Sanders. Dr. Hoadley is an avid sports fan, and enjoys running, basketball, golf, and coaching his children's athletic teams. Doctor Hoadley is a groin pain expert who consults with the Georgia Bulldogs, Georgia Tech Yellow Jackets, and the Atlanta Falcons football teams, as well as the Atlanta Thrashers hockey team. Dr. Hoadley is an accomplished sports hernia surgeon and has a specialty website about sports hernia surgery at Sports Hernia South.